Wizards, priests, and other characters who carry a small arsenal of magical items can not keep all the operator's instructions within easy reach with these useful reference cards. The front of each card lists a magical item's game statistics and special icons that quickly identify the item's type and who can use it. On the back of the card, the item is described in detail, eliminating the need to waste precious gaming time combing through books to see how it works. When the character identifies his or her latest find from a treasure hoard, the DM can simply hand over the corresponding card, and the game goes on! 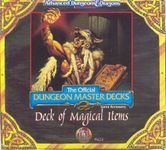 Over 400 magical items from the DUNGEON MASTER Guide and the Tome of Magic are included, plus a few cards that can be used to record specialty or or original items. This item never had a checklist included with it. Here's one I created to verify my own copy.Hopefully others will find it useful as well!